THE STORY - Rick Blaine (Humphrey Bogart), who owns a nightclub in Casablanca, discovers his old flame Ilsa (Ingrid Bergman) is in town with her husband, Victor Laszlo (Paul Henreid). Laszlo is a famed rebel, and with Germans on his tail, Ilsa knows Rick can help them get out of the country. THE GOOD - Excellent performances, incredible screenplay, iconic visuals and an engaging story that balances the serious and dramatic elements to perfection. ​​​Throughout the history of cinema, there are many examples one could point to as exemplary additions to the medium. Some of these films that may not have even been truly appreciated in their time, but today we come to admire the great treasure they provide. When one takes a look back at that history, there are still so many wonderful works of art that continue to amaze and inspire even today. 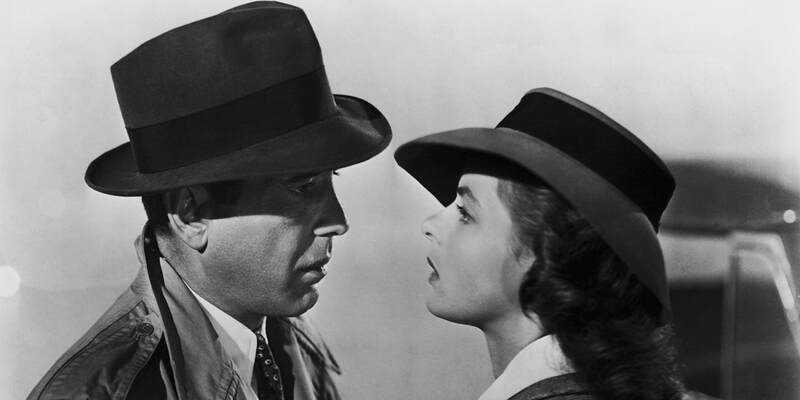 "Casablanca" is one of those experiences, and it definitely has earned its staying power. The events of the film take place over the course of a few days in the namesake city, currently finding itself a focal point during World War II. Our hero, or at the very least protagonist, is Rick Blaine (Humphrey Bogart). He is an American expatriate who is also the owner of the city’s highly popular nightclub, where the drinks are pouring, the gambling is persistent, and Rick’s watchful eye is always sternly objective because “he sticks his neck out for nobody.” Rick enjoys his morally ambiguous lifestyle until a political refugee enters his life seeking assistance. The matter is complicated with a specter from his past, a former lover named Ilsa (Ingrid Bergman), that entangles him further into this complicated plot. There are so many elements to the film that are worthy of so much praise that it can be difficult to know where to start. It would seem that the best place to do that would be the wonderful performances by this ensemble. Truthfully, Humphrey Bogart has never been an actor I though exuded great range, but he does carry an undeniable screen presence with him. "Casablanca" exemplifies all of this. There never really is a moment that Bogart impresses one with a performance of dynamic emotional range, but his persona fully embodies the authenticity of a cynic trying to rediscover his humanity. It’s a wonderful counter to the soulfulness of Bergman’s performance, who has the ability to melt your heart as soon as you get a glimpse of those misty eyes, whether from melancholy or seething rage. The legacy of Bergman as one of cinema’s finest actors is certainly lived up to in this role. Still, the supporting players offer quite a bit of flavor to the film as well, adding a rich texture to the sense of place to the film. The best member of the supporting cast is undoubtedly Claude Rains as Captain Louis Renault, a corrupt French commander of the military forces in Casablanca. Rains is all charms and witticisms in the role, always providing the best quips and a great sense of report with his fellow actors, particularly Bogart. His instantly recognizable voice makes all his dialogue sing. Like Rick, his morals are just as compromised but can be just as indulgent on friendship and sentimentalism, and Reins plays it to perfection. No doubt you will smile whenever he appears on the screen. Other performances are also exceedingly well captured. Paul Henreid plays the political refugee Victor Laszlo, who often must carry a stoic presence in the fight against the oppressive forces against the Nazis. It’s an appearance that rarely cracks, and one senses his distant pain turning to great strength at every moment. Conrad Veidt as the sneering German major attempting to stop Laszlo’s successful escape into America is a nice villainous turn. Even Peter Lorre’s brief appearance as a street criminal carrying the plot’s most important device is entertaining. And the warmth provided by Dooley Wilson’s Sam and his piano is always appreciated. Even with all these magnificent performances, it would be difficult to recognize any of them without the absolutely brilliant screenplay they were given. Like many elements that have stood the test of time with this film, the script is a perfect example of great dialogue, rich characters, and thematic depth all colliding together to create a story that is both beautiful and tragic in equal measure. It’s also quite a humorous script as well with many great one-liners. It truly has rightfully earned its place to be remembered as one of the greatest written pieces to ever be produced for the screen. It presents a great foundation for the rest of the film’s technical marvel, including Michael Curtiz’s impeccable direction, the luscious score (Complete with the adapted song “As Time Goes By”) and the gorgeous imagery that perpetuates the entire film. It’s difficult to categorize anything as a perfect movie. One could point to flaws in "Casablanca" if one were inclined, but they feel so minimal compared to the rest of the fantastic elements on display that to name them would seem tedious and unnecessary. As soon as the main titles end, you are transported into a world filled with great performances and an incredibly sophisticated screenplay that takes advantage of every emotion you can think of. The film is dramatic and thoughtful while never losing the thread of entertainment. There is a reason why the film has maintained its status as an undeniable classic, and it is a banner it continues to proudly wear.